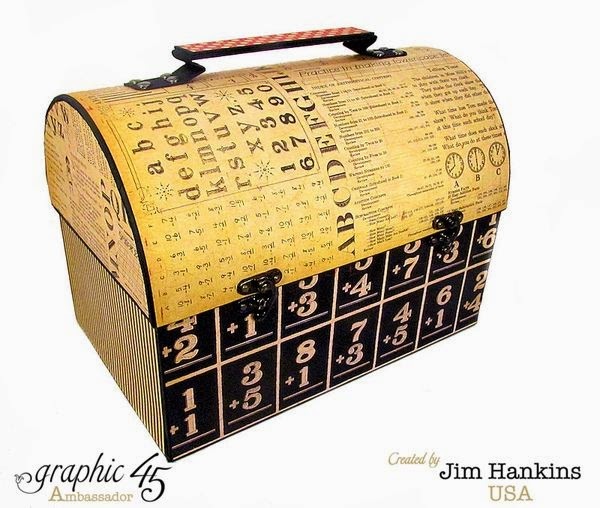 The Gentleman Crafter: ABC Primer Day at Graphic 45!! Please join me over at Graphic 45's Blog today to see what the Graphic 45 Ambassadors have come up with using the ABC Primer Collection. Please come see what's inside the pail at Graphic 45 blog....HERE...If I made it, it's gotta have something inside right? Thanks for coming by and have an AWESOME day! OMG!! Love it!!! I can see me using this!!! Can I just say WOW! The lunch box is so adorable and when it is opened (saw it over at G45) - all the wonderful drawers were such a surprise! Thanks for sharing your talent and art. Jim, Jim, Jim, where do you come up with these ideas? Incredible, I love it! I expected to see a thermos inside, the drawers were a nice surprise. OMG ... saw the G45 Blog ... is amazing... you always blow me away with your creativeness ... so very cool. love that ABC Primer ... so fun !! This is fabulous. Is there a pattern coming soon the store?